No.3 The Old Print Works is situated in a little square just a few steps away from local restaurants and shops. Only 5-10 minutes walk from the train station, and close to all the historical sites in Winchester such as the Cathedral and the Great Hall. 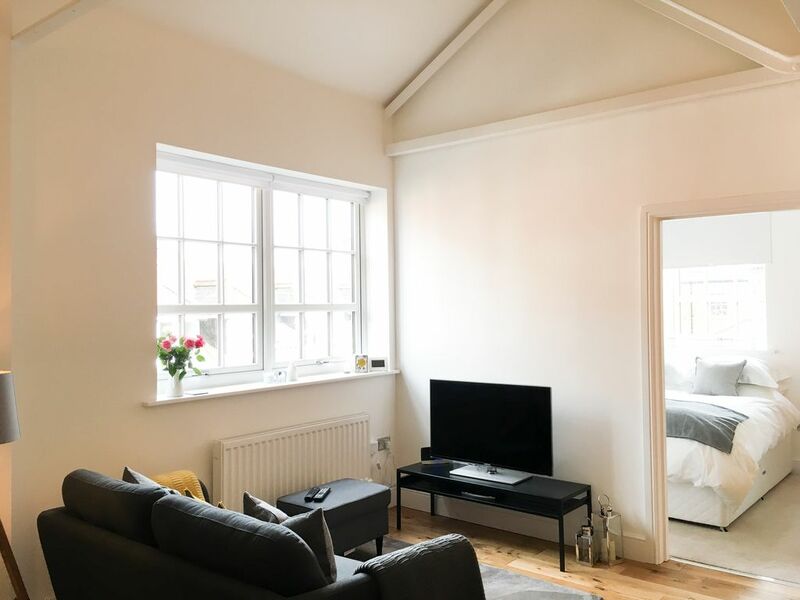 Newly built within a beautiful and carefully restored period building, the apartment is modern and light, with stunning high beamed ceilings and large bright windows. The open plan layout is very spacious and light, and the bedrooms are cosy & snug, with comfortable beds and luxury bedding. If you are staying for a few nights, there is a small bedside table and fitted wardrobe in the main bedroom where you can unpack your things. The second bedroom is on the mezzanine floor, which is a stunning space, open to the lounge. Its lovely and cosy, with a pitched ceiling and plenty of space at the foot of the bed. Suitable for 1 adult or 2 children. A stair-gate is available and we also have a travel cot should you need it. We have installed blackout blinds to the lounge to ensure a good nights sleep is had. The kitchen is fully equipped with high quality appliances, tableware and utensils. On arrival there will be a small welcome basket of essentials, such as Milk & Bread. The bathroom is high spec and has a bath with a rain shower and an additional standard shower attachment. We provide lovely fluffy white towels. Winchester is an enchanting, bustling city, steeped in history and character. No.3 The Old Print Works is the perfect base from which to explore. It is also within easy reach of many lovely places near by, such as Long Barn Lavender Farm in the beautiful village of Alresford, or St Catherine's Hill where you can hike up to the highest point in Winchester, to take in the views of the city. Further afield you may like to explore the Historic Dockyard in Portsmouth or the stunning British Coastline, both reached in less than 40 minutes by car. London is also within easy reach, being only an hour by car or train to Waterloo. The property comes with a parking space adjacent to the apartment. High quality 400tc bedding provided. Non feather pillows & duvet available on request. Good location , clean modern flat with adequate space . Just a couple of suggestions , update sp to include 5G , instructions to the hob and a few more coasters . I would recommend the flat and come again . Great apartment in the center of Winchester. We didn't use the loft, didn't even go up there, but the downstairs was very nice. Finished to a high standard, it had everything we needed. It was an easy walk to the pedestrianized Main street, with lots of great restaurants. Well equipped Kitchen with a large fridge/freezer. The parking is a little tight, but a real plus. Highly recommend and would return. Only mildly negative comment relates to noise from outside the apartment particularly very late on Saturday night. Otherwise a superb flat right in the heart of the city. Beautiful town and great location. Property was as promised. Great location and very clean and modern. A good value. I don’t think you could find a better spot with parking. Property owner was easy to work with and responsive. Had a lovely weekend, we love Winchester and the weather was brilliant! The apartment is excellent, comfortable and convenient for the city, and we had a walk to St. Catherine’s Hill without having to drive at all.